Designed to match our popular deluxe haircutting cloths. Sized to provide more coverage than other aprons and designed with an adjustable neckline for a customized fit for evey user. Extended length to aid cutting of long hair and protect the client cape. 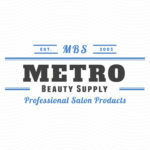 Stop cutting capes when you're cutting hair, stop staining capes with salon chemicals. Cape collars are the way to make all of your apparel last longer. 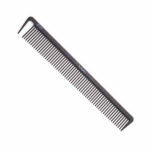 This Comb has fine-tooth spacing which makes it ideal for wrapping perms or any technique where you need to smooth the hair with fine detail. It is also great for dense back-combing. 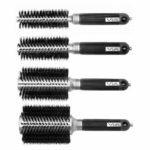 Combine the hair health benefits of ion generating combs with the smoothness of silicone/graphite and heat resistance of carbon and you have the best combs ever made! We have redesigned what were already one of the most popular combs ever made. See for yourself how we have improved on perfection! The extra long European style has added teeth for more control of each section. It's great for use with longer shears and perfect for scissor-over-combs techniques. Combine the hair health benefits of ion generating combs with the smoothness of silicone/graphite and heat resistance of carbon and you have the best combs ever made! We have redesigned what were already one of the most popular combs ever made. See for yourself how we have improved on perfection! This comb has wider-tooth spacing which makes it ideal for weaving and other techniques where you want some separation within the section. It is also great for loose back-combing. Combine the hair health benefits of ion generating combs with the smoothness of silicone/graphite and heat resistance of carbon and you have the best combs ever made! We have redesigned what were already one of the most popular combs ever made. Via Crystal Ion Paddle Cushion Brush is the perfect brush for long hair and up-dos. A great oval brush that looks fantastic in any setting. 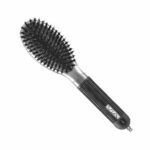 They incorporate tourmaline resins in the bristling which causes the brush to generate negative ions when it is brushes through the hair. The ions atomize the water droplets making them small enough to penetrate and condition the hair. The ions also help to restore the damaged cuticle of the hair so it can retain the moisture, making your hair healthier every time you brush! These combs are the perfect comb for the low tension cutting techniques needed for curly, wavy and/or thick and ethnic textures. The evenly spaced teeth provide uniform distribution of hair within the section for cleaner bob lines. 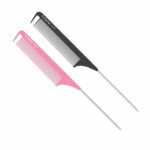 The separator tooth on this comb speeds sectioning and allows the stylist to regulate the amount of hair in the section. Pockets for 8 shears and additional pockets for combs, razors etc. Zippered mesh pocket for larger items like a trimmer. Snap pocket to keep small items organized. Includes a durable, re-usable EVA foam case for mailing shears for service. Envelope included. What better way to protect the tools of your trade. VIA's new water bottle features an ultra fine mist sprayer.Consistent fine mist unlike any other water bottle!Fill it, pump it a couple of times to fill the water tube and you'll have instant fine mist with every pull of the trigger till the bottles empty.It never loses it's charge.You'll love the comfortable soft- touch bottle too! 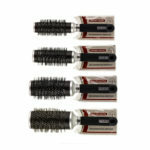 Via boar brushes conditions hair with Ion generating bristles! 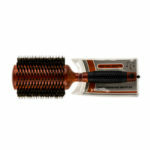 Groom and shine your hair with natural 100% 'First Cut' Boar Bristles. Features: New massage grip is comfortable and stimulates circulation. Natural Crystal Ion-Generating Bristle in every tuft of boar - conditions while you brush. Provides better penetration and grooming. Elongated neck eliminates hair snagging on the rubber grip.